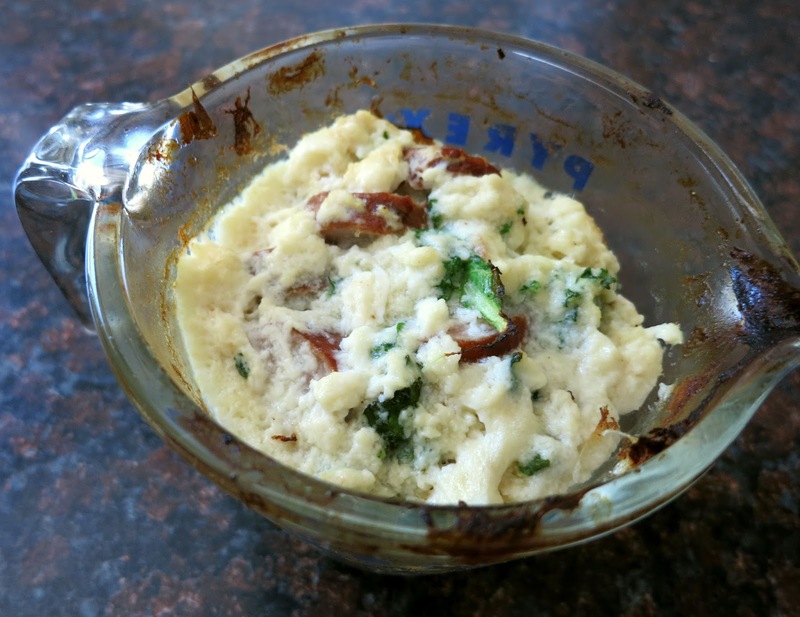 Take a ramekin or other small dish, and grease it well with olive or other choice of oil. (I improvised and used a Pyrex dish since that's all I have haha). 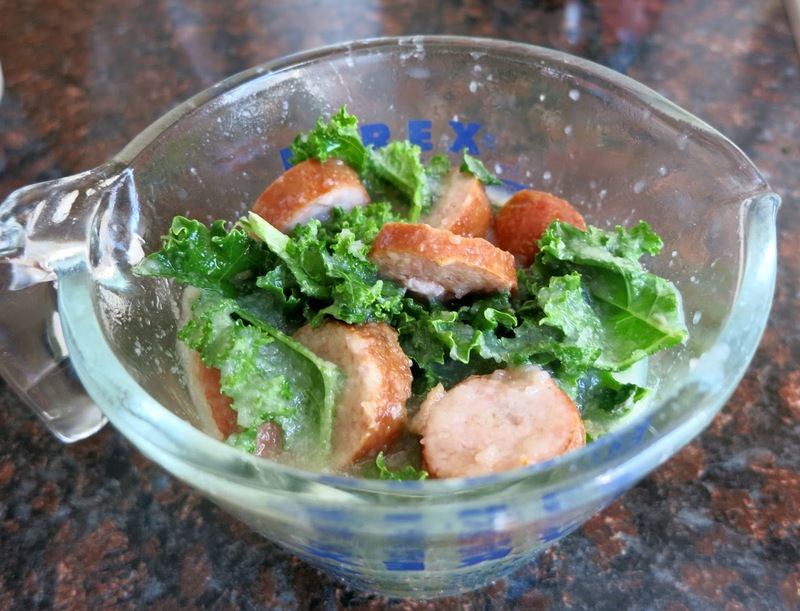 Slice your sausage and add to dish, along with the kale. 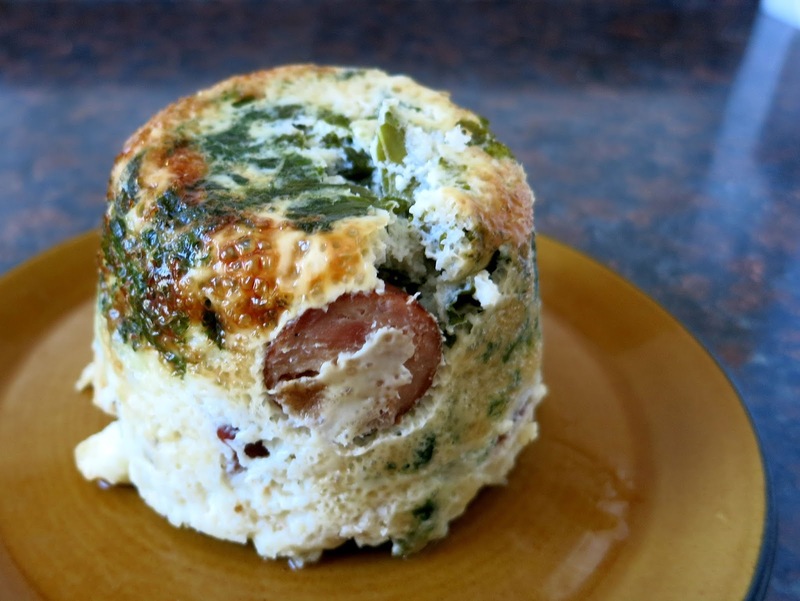 In a separate bowl, whisk together eggs, applesauce, and salt, and pour into the dish, covering the kale and sausage. Bake in the oven on 350 for about 30 minutes, or until the "cake" is set. 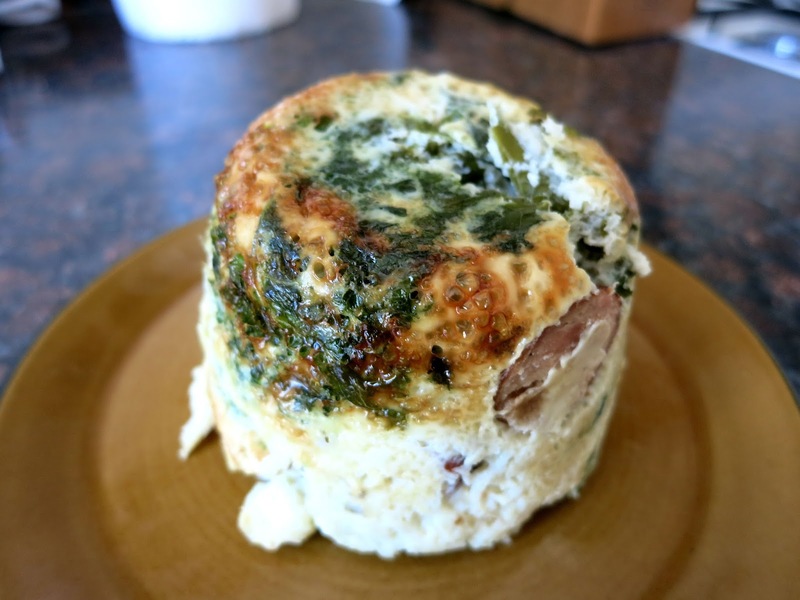 If you notice excess liquid gathering at the top after about 15 minutes, carefully pour out and return back to oven. This will allow the cake to set and bronze better. Once firm, remove from the oven and wait for about 5 minutes for the dish to cool slightly, then turn over onto a plate and enjoy the combination of sweet and saltiness :-) You could choose to serve alone, with ketchup, salsa, or anything else creative you come up with! I would love to know what your thoughts are on this interesting combination! Thank you very much for posting and sharing this great Blog.Please visit for More information about. Thank you sir, this is a Fantastic content. Thanks for discussing with us. I understand many factors from this content. Thanks for publish this beneficial publish Please check out for More details about.. Thanks for all your information, Web page is excellent and useful material. KRC limited Recruitment is looking for the candidates for the post of 14 Senior Technical Assistant & Junior Technical Assistant. in connection with Patch doubling of KRCL route, New crossing stations, Railway Electrification, NTPC -project at Gadarwara /Madhya Pradesh , Kudgi in Karnataka. and it's catering to the demands of the consumers. shifting. In today's scenario there is a need for efficient packing and moving services and this is why associate Packers and Movers is serving the clients. If you need to shift your home office worker then the company of associate Packers and Movers is here and it will help you in shifting without any problems. The whole process of shifting is efficiently organised so that there is no problem to the customer and the rates also best. International Packers and Movers is meeting the demands of the client for quality household shifting. This is why many of the customers are choosing Bharat International Packers and Movers for their home office and car shifting requirements. At the destination the packing is unpacked and unloaded and it is installed at the client premises so that he can start his living without any problems.